This is a guest post by Danna. 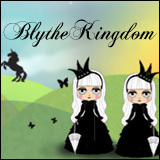 If you’re interested in contributing and writing for BlytheLife.com, click here for more information. I opened the plain brown box with the anticipation of a child on Christmas morning. My heart raced. Cutting through the tape carefully so I would not accidentally nick what was inside, I grinned and felt a little silly at my excitement. I removed the tissue paper used as packing, and there it was… there SHE was looking up at me through the cellophane window with light pink eyes, the whisper of a smile on her pale pink lips. I am sure those of you reading this can relate to the feeling that comes with opening your first Blythe. If you had told me a few years ago, that I would be so enthralled with a doll, I would want to own one…at my age…I never would have believed you. 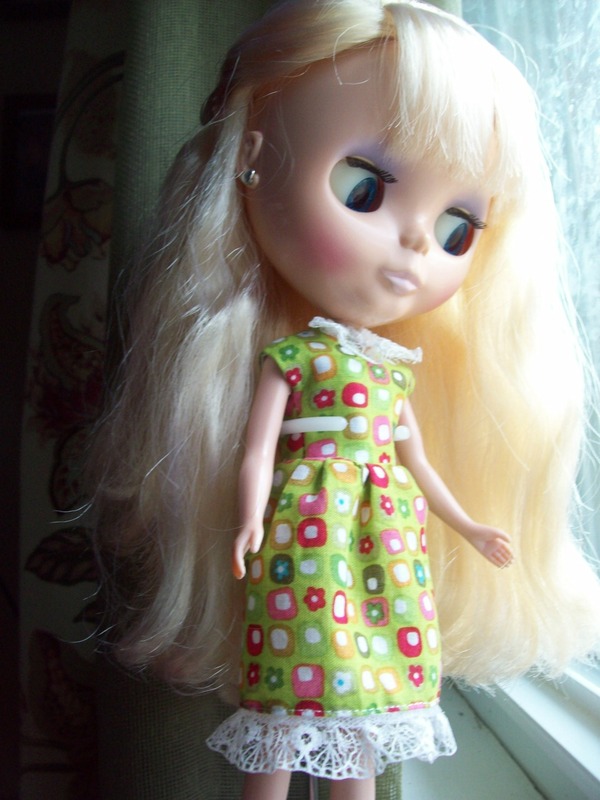 I met Blythe late one night while visiting one of my favorite blogs, “One Crafty Mumma” by Melissa Goodsell. 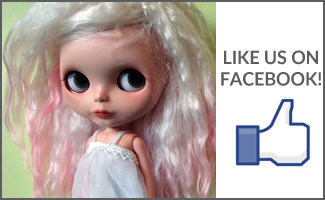 She posted about a strange little doll with a large head and changeable eyes that her daughter had received. I had never seen one before and I was more than curious who she was. To be honest, I was put off at first. Her eyes were, you must admit, a little creepy. However, I took the subject and ran with it. Searching well into the night about the odd little gal that no one really wanted in 1972. It didn’t take long for me to be ensnared in her web of cute. And yes, I grew to see the beauty in her coy glance and pursed lips. The proportions of her head to her body didn’t seem so odd to me, the more I looked at her. I was absolutely amazed at all of the variations people had achieved when customizing her. She looked almost alive in some cases. 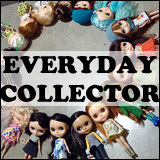 I could not afford to spend hundreds of dollars on a doll…for myself, so I started looking at other, more affordable dolls. The first one I found was a thrift shop find, a vintage, bubble cut Barbie. I snatched her up and proceeded to add to my budding collection by following her up with a “Bratzillaz, Meyganna” doll, who has amazing eyes and horrible hair, and then a “China Girl” doll, from “Oz the Great and Powerful.” I also found a “Littlest Pet Shop Blythe” on the clearance shelf, but no matter how many inexpensive, albeit cute dolls I purchased my longing for a Neo Blythe doll would not go away. I searched…and researched…and “watched” on eBay to see what the girls went for, hoping that one day I would discover that treasure meant for me. And then finally, one night, I found her. She was not the most desirable girl or so I read. In fact, there were many bad reviews about her horrible curly hair and her extreme downward gaze, but she was the right price for me and I loved her coloring. “Fairy Girl” was her nick name and “Silver Snow” is what they called her. Her long blonde hair seemed to change color in different lighting and her pale lips and lavender eye shadow were sweet and natural looking. I knew she wouldn’t be perfect, but she would be the perfect first doll for me. I held my breath and clicked “Purchase” and she was mine. So why are these girls so interesting and hard to forget? Is it their large heads full of hair just begging to be styled, or is it their unusual eyes that are so innocent and expressive? I’m sure it’s different for everyone. For me it brings back the days when I was a girl. I would spend hours in my room playing with Barbie and my other dolls. Blythe replays those happy memories, of childhood and innocence, and of when all I had to worry about was what happened to Barbie’s other pink shoe. Is it ridiculous and pointless to play with dolls at my age? Probably… but hey, I am an adult and I can do what I want. Thankfully, there are thousands of other adults like me, who can’t wait to get out the little hair brush and tiny clothes, and sit down to play if just for a few moments. I see nothing wrong with that. As for my collection…I’m seriously ogling a custom girl from SoulGirlDolls or a stock Snowflake Sonata (a nod to my days as a dancer) So far, my husband hasn’t asked what that odd doll is doing up there above the fireplace. I suppose when there are two or three up there; I’ll have to admit my addiction. 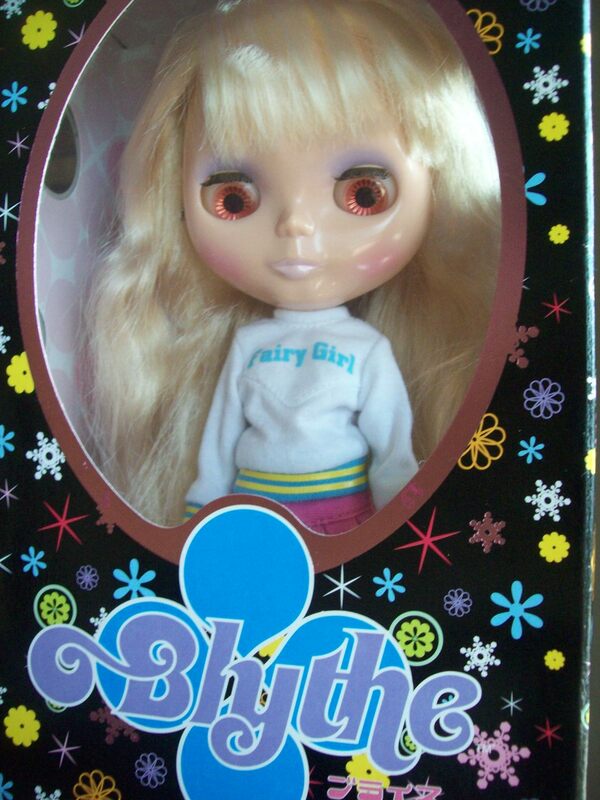 For now, I’ll just keep it to myself…and share it with the community of Blythe lovers out there. Thanks for understanding! About Danna: I am a wife, mother, artist, jewelry maker, antique collector, and aspiring published author with a dancer’s heart. I have a blog where I talk about my novels and a blog where I share my craft projects. I also have an Etsy shop where I sell handmade and vintage goodies. You can find me on Twitter under @dannastarr2002 and on Flickr. 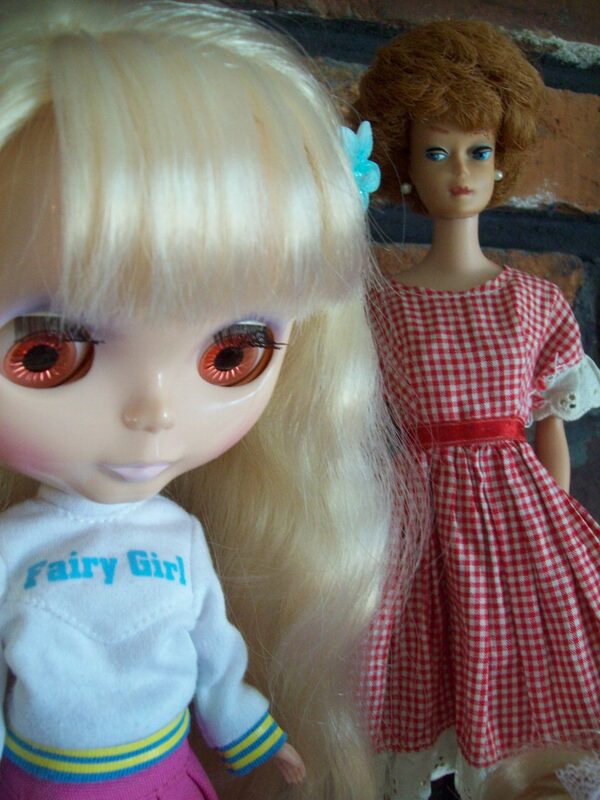 Fairy girl is such a sweet looking doll. Great post. 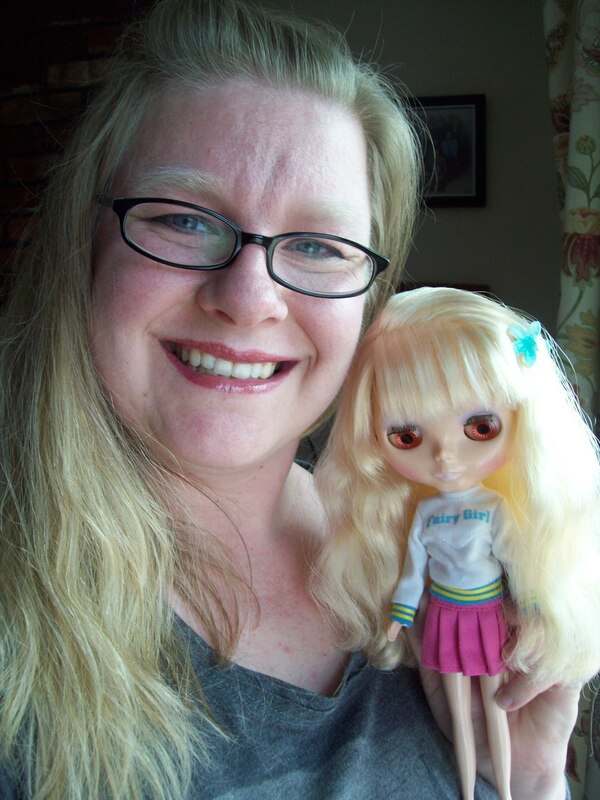 Enjoyed reading about Danna, who is yet another Blythe doll fan. Thanks for sharing. Thank you! I am glad I got to share my Gal with you.